The Heavenly Father sent RJ and Chris on their mission for a reason. Synopsis: RJ and Chris are two young Mormons who have embarked on their first mission. As they get into routines, they begin to question things including their faith and themselves. They also find that they have something in common – an attraction to each other. While the Church threatens to tear them apart literally and emotionally, they each must find their own path. I watched this film for the first time several years ago, and recently watched it to review The Falls Trilogy in sequence. 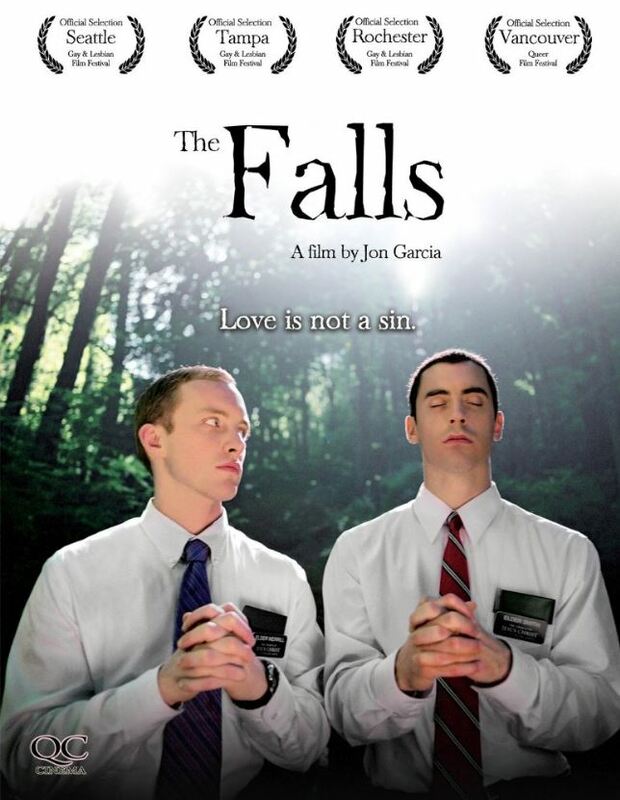 I forgot how much I liked this film, and how true to life it is for so many LGBT Mormons. For so many people, they have been forced to choose between the truth and human nature, or everything else that their Community holds out for them as what their lives should look like. RJ and Chris start out working as missionaries and settle into life serving their Church. But as they encounter more people that they are supposed to convert, they are continuously served challenges to their faith. Chris’s self-questioning leads the pair towards discovery about each other, and a relationship begins. I particularly like the character Rodney who is one of the people RJ and Chris talk with about conversion. He is a person who has his own problems, but is also like a breath of fresh air to the companion missionaries. He smokes pot and drinks beer, and doesn’t care what you are or who you love. I almost wish his character and RJ and Chris’ interactions with him had been more developed as he represents the complete antithesis of their lives up to this point. Of course, the relationship cannot go unchallenged, and when a Church peer discovers what is going on, they have choices to make about how to proceed. There is a particularly impactful scene where RJ is speaking to a Church elder that speaks volumes about how far he has come in his journey. Unfortunately, we don’t see this with Chris to know one way or the other. For a very low budget, independent film, The Falls was well done. I like the fact that the characters seem very genuine. The characters are from real walks of life, and although the gay coming of age story has been done a thousand times, few are like this.